Alignstaffing developed our SMRT System in response to the acute substitute teacher needs in the educational facilities we work in every day. Our Substitute Management Recruiting Team System (SMRT System) is an innovative and consultative approach to the problem of hunting for qualified, available, and certified substitute teachers. Our SMRT System is no accident. Instead, it was carefully curated over years of working inside and outside of our local school systems. Through our advanced understanding of educational facility needs, we engage in year-round recruiting to identify qualified, available substitute teacher candidates with the right skills and experience for a variety of settings. Through the implementation of our SMRT System, we have become a leading resource for our clients’ Human Resources departments and call out systems. Instead of paging through a stack of business cards or hoping another teacher can cover class, educational facilities can trust alignstaffing to provide a phenomenal candidate that raises the bar on what they expect from substitute staffing. Creating the ideal match between a candidate and an employer requires a complete understanding of the unique needs of an employer, as well as the attributes to look for in the right candidate. We use a team approach that allows each recruiter and business consultant to focus entirely on one job role or employer type, for the best possible results. Each of our business consultants specializes in a specific type of employer within the education , social services or behavioral health sectors. When alignstaffing handles your staffing needs, you’ll work with a business consultant that understands the unique nature of your organization, the types of staffing you need and the problems you face. The business consultant then works with a team of recruiters, each of which specializes in a particular job role. By using this team approach, we’re able to make the best use of our specialized business consultants for our clients, and recruiters for our candidates, creating the perfect match. Each of our engagements begins with a profile analysis of our clients. Not only do we find out about open positions, but we look at how the business is run, what some of the systemic issues might be, what your unique challenges are and what opportunities exist that you may not have considered. Because of our deep industry expertise, we already know many of the challenges you are up against and we keep on top of new laws and legislation that affect your organization. By asking the right questions and analyzing the issues, we’ve been able to not only fill positions, but make recommendations in training, workflow and how to save our clients money in their future staffing needs. We are trusted advisors to our clients. With our roots in rehabilitative therapy and behavioral health specialist placements in D.C. charter schools, as well as health-related government contracts, alignstaffing has deep expertise in all things healthcare, social services and education. We are not a general temp agency or mass recruiter – we specialize only in our three core areas. Our contacts on both the client and candidate side are strong. We particularly enjoy connecting experts from related fields to our clients at luncheons and other events throughout the year. To meet the staffing needs of our clients over the long-term, and not just fill an immediate need, we’ve developed a unique scientific method to gathering information about candidates and matching them with the right client. We call this method Rapport™. We’ve grown to our position as one of the top providers of healthcare, education, and social services staffing in the Washington, D.C. area by acting not just as a staffing firm, but as a consulting firm for our clients. We help them achieve their staffing goals more efficiently, and ensure the long-term success of our candidate matches. Rapport™, our proven information gathering and matching method, pairs highly-qualified candidates with the ideal client. From position analysis through careful monitoring after placement, this process ensures success from all sides. 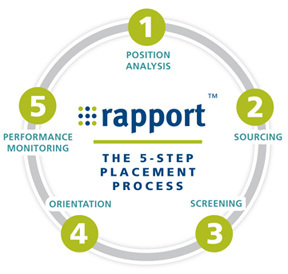 The first step in the Rapport™ process takes place before we begin to recruit candidates. When we receive an open position, we gather as much information about the opportunity as possible. This step enhances our ability to identify the best-matched candidates available and truly provide the best specific fit to the position. Our industry-specific recruiters utilize a range of tools to locate the most qualified candidates for each open position. A wider variety of sourcing options enables us to draw on as many candidates as possible to find the ideal match for each position. Each potential candidate is screened to determine the best-matched candidates for each opportunity. We do all background checks and use a series of screening tools that enable us to understand the candidate beyond the resume, further enhancing our ability to identify the ideal candidate for each position. Once a candidate is selected for an opportunity and their eligibility for the position is confirmed, we conduct a thorough orientation process in order to ensure that our candidates are confident and prepared to work when the start date arrives. Alignstaffing understands that one of the most important elements in filling a position is what happens after the candidate has been placed. We follow up. Our established performance monitoring system ensures total satisfaction for both our clients and candidates for the duration of the contract.